Efo riro is vegetable soup of the Yoruba tribe in Nigeria, it is the the Yoruba version of the Efik Edikang Ikong soup but with a twist. 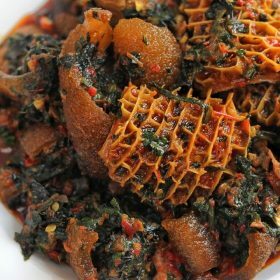 Efo riro is rich and has a savoury taste. Efo riro can be prepared with assorted meat, fish, vegetables and maybe tomatoes. It can be paired with amala, pounded yam and eba etc. it also goes well with boiled yams, rice and plantains. Even though it is a Yoruba soup, it is being enjoyed in all parts of Nigeria. With most soups and sauces from the West African region, meat and fish are cooked in water and spices to form broth or stock which in turn serve as the base for various soups. To save time, the meat and fish should be cooked prior to the main cooking, so that the soup can be ready in about 20-40 minutes. Blend the peppers and tomatoes and set them aside. Spice and boil the meat till its tender, allow it to cook till the stock is thick. Cook cow leg and shaki in a different pot until they are tender. In another pot, heat up palm oil and bleach a little. Add chopped onions to add flavour. Add the blended tomatoes and peppers in the oil, fry until the mixture loses its sour taste; this should take about 15 minutes. Add the cooked meat, the ground iru, crayfish and bouillon cubes to taste. Stir, cover and leave to boil for 10 minutes. After 10 minutes, add the Efo riro and salt to taste. Stir well and leave it to simmer for 5 minutes. (Taste for salt, bouillon cubes and pepper). Bon appétit! You can serve with Pounded yam, eba or any other fufu meal. This entry was posted in Nigerian Food and tagged African food, African recipe, EFO RIRO, Nigerian food, Nigerian recipe.